Canadian eventing riders earned impressive results in all divisions against a world-class field of competitors on home turf at the 2013 Volvo CCI 3* Bromont Three Day Event, The Todd Sandler Challenge, held June 6-9 at the Parc Équestre Olympique de Bromont in Bromont, QC. In the advanced CCI 3* division, Selena O’Hanlon of Kingston, ON took second place with Foxwood High, a 10-year-old Canadian Sport Horse gelding owned by John Rumble. They were tied for 12th after a dressage score of 60.80 penalty points, but quickly moved up to fifth place due to an impressive cross-country performance. The cross-country course featured a challenging track designed by Bromont’s (FEI 4*) course designer Derek Di Grazia of the U.S., and built by Canadian Jay Hambly of Fergus, ON and his team. Despite the rainy weather, O’Hanlon and Foxwood High incurred no jumping and just 4.80 time faults. They continued to move up the ranks after putting in a perfect round and adding no faults during Sunday’s final show jumping phase. This allowed them to finish on their cross-country score of 65.60. O’Hanlon also took fourth place in the CCI 3* division aboard Bellaney Rock, a 14-year-old Irish Sport Horse gelding she co-owns with her mother, Morag O’Hanlon. They started out the competition in sixth place after receiving a dressage score of 57.10 penalty points. They added no jumping, but 8.40 time faults during cross-country, before wrapping up with just one lowered rail for four jumping faults in the show jumping phase. Their final score was 69.50. Kyle Carter (currently of Citra, FL) was another Canadian who earned a top 10 result in the CCI 3* division-which is a heart-warming feat, considering that his 15-year-old Thoroughbred gelding Madison Park was never expected to compete again after experiencing a serious leg injury during a competition in England back in 2011. Madison Park, who was Carter’s World Equestrian Games, Olympic Games, and Pan American Games mount prior to his injury and two-year hiatus, proved he is returning to top form, achieving a score of 54.00 penalty points in dressage to stand in fourth place. They put in a clear jumping effort during cross-country, but added 10.40 time penalties. Multiple rails in the show jumping phase brought their final score to 80.40 and earned them a top 10 finish, in eighth place overall. O’Hanlon also placed with a third mount in the CCI 3*. She scored 106.30 overall for a 12th place finish aboard A First Romance, an 11-year-old Thoroughbred/Canadian Sport Horse-cross gelding she co-owns with Morag O’Hanlon. 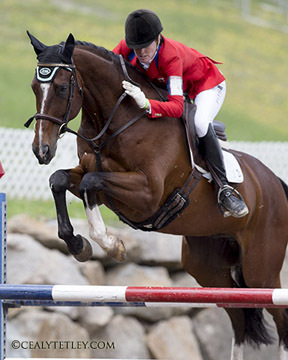 The CCI 3* division was won by American Olympian William Coleman III aboard Obos O’Reilly. In the CIC 3* division, Jessica Phoenix of Uxbridge, ON (Canada’s highest-placed Eventing rider from the 2012 London Olympics) finished in second place. Riding Pavarotti, the 11-year-old Westphalian gelding owned by Don Good-her individual gold medalist partner at the 2011 Pan American Games-Phoenix secured second position after scoring 47.70 penalty points in dressage. They moved down one spot to third after completing the cross-country phase with zero jumping and 27.60 time faults. However, they moved back up to second at the completion of the show jumping phase, where they left all the rails up for no jumping and just two time faults, ending on a final score of 76.30. Phillip Dutton of the U.S. was the winner of the CIC 3* riding Ben. The CCI 2* saw Lindsay Beer of Midhurst, ON claim sixth place riding Penny Beer’s 11-year-old Trakehner gelding El Paso. Beer rode to a score of 59.50 in dressage, and followed up with zero jumping, but 16 time faults in cross-country. The duo knocked two rails, but added no time faults in the show jumping phase for a final score of 83.50. Phoenix also contested the CCI 2* division, this time paired with Abbey GS, a 12-year-old Trakehner mare owned by Charlotte Schickedanz. They finished on a score of 105.10 to take 10th place. The winner of the CCI 2* division was Mettraise, piloted by American Erin Sylvester. Waylon Roberts of Port Perry, ON was the winner in the CCI 1* division riding Yarrow, an up-and-coming six-year-old Canadian Warmblood he co-owns with his mother, Kelly Plitz. Bromont was just the second time the young homebred gelding competed at the CCI 1* level, but he put in a polished dressage performance, scoring 45.70 penalty points for second place. A faultless cross-country phase moved them into the lead, which they kept after lowering just one show jumping rail for a total score of 49.70. In addition, Roberts took 12th place in the division on a final score of 61.40 aboard Orion 49. Also placing was Frederick Lagimoniere of Sutton, QC and Esmerelda, who finished in eighth place, scoring 61.30. 2013 marked the 27th year for the Bromont Three Day Event, which had an even more exciting atmosphere than usual this year, thanks in part to the FEI Level 2 Course for Eventing Judges, Technical Delegates & Course Designers organized by Equine Canada. The course was held in conjunction with the competition and welcomed participants from across North America, as well as Belarus, Brazil, Costa Rica, and Guatemala. It was led by FEI Eventing Committee Chair Mr. Giuseppe Della Chiesa (ITA), along with FEI 4* Dressage/Eventing Judge Sandy Phillips (GBR), FEI 4* Eventing Course Designer John Nicholson (NZL), and FEI Eventing and Olympic Director Catrin Norinder (SWE). The Volvo CCI3* Bromont Three Day Event, The Todd Sandler Challenge, is held in proud memory of Canadian Eventing rider Todd Sandler of Dollard des Ormeaux, QC. Sandler was one of Canada’s most exciting up-and-coming eventing prospects, having been named to the 1998 Canadian Young Rider Three Day Event Championships team and the 1999 Canadian Eventing Team Talent Squad. A tragic car accident took Sandler’s life on April 26, 1999. At the time of the accident, Sandler was just 18 years old, and was returning home from the Rolex Kentucky Three Day Event. For more information and full results, visit www.bromontcci.com. it could have been mention that on CCI* Frédérick Lagimonière on Esmeralda was the only tandem to make a double clear on both show jumping et cross-country. Sorry to change the subject, but does anyone know when our Canadian top riders will be in the Toronto area for a show this summer?